Well, the ZuneHD rumors have now been confirmed by Microsoft and it's coming this Fall. And they are talking about a tie-in with the XBox Live service too. Looks like the ZuneHD is targeted as a direct competitor to the iPod Touch. The Zune HD comes with a built-in HD Radio receiver - I like this idea although it's not something I'd pay much extra for to get the feature. Still its a differentiater that should help. 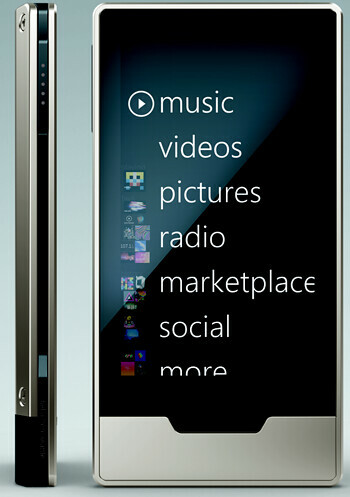 Zune HD will include a full-screen Internet browser optimized for multitouch functionality. Zune HD is Wi-Fi enabled, allowing for instant streaming to the device from the more than 5 million-track Zune music store. I see a few things here with the Zune HD that are interesting for sure and I definitely would love to see Apple get a little more competition on the iPod front. But you know what I see glaringly missing from the Zune HD press release? There is no mention of any Microsoft MediaCenter tie in - absolutely none. I hope I'm wrong on this, but this really sounds like once again MediaCenter is not going to get "connected" to another Microsoft hardware device. The ZuneHD Website is now live as well.